Pack of 12 premium quality white muslin squares/wraps. Made from 100% cotton. Machine washable. 12 pack premium quality white muslin squares. Great for many uses including a newborn flat nappy (for the first few weeks). Just fold as you would a terry square or pad folded. Very slim fitting. 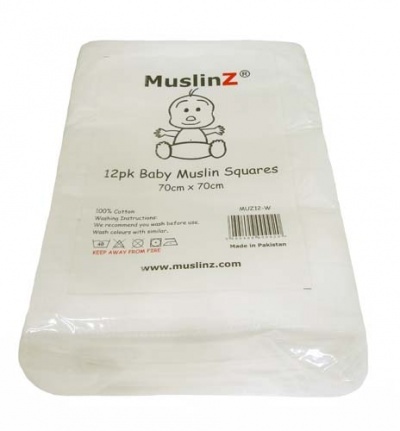 You can add a booster if you want extra absorbency or layer to muslins together. Fasten with a Nappi Nippa and use a nappy cover (wrap) over the top.